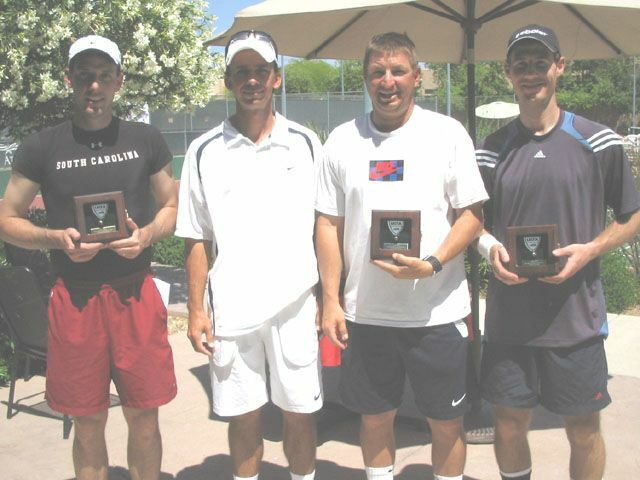 Some of the best senior men’s players were at the Scottsdale Athletic Club in Scottsdale, AZ for the USTA National Men’s 35 Hard Court Championships, and a Grade 1 ITF tournament. The quality of play and depth of field was fantastic. There were a number of remarkable comebacks in matches during this tournament too. The 35s doubles saw a new champion emerge, Jesse Ponwith (Scottsdale) and Jerome Jourdon (Phoenix), defeated Robert Bull (Phoenix) and Chris Carey (Kansas City) 6-2, 6-2 in the final. Ponwith/Jourdon escaped from the semis with a 6-7, 6-2, 7-6(5) win over the second seeded team of Christopher Cages (Durham, NC) and Kline Sack (new York, NY). In the 35s singles Oren Motevassel (Austin, TX) was a repeat Champion and defeted Morgan Shepherd (Boise, ID) 4-6, 7-6, 7-5. Congratulations to all the Phoenix Area winners in this USTA National Championships! Click here for the link to all the draws.